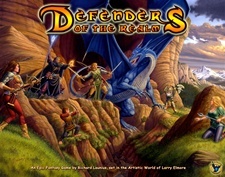 Other products in the "Defenders of the Realm" series. My first "real" board game experience was Pandemic, but even with that sentimental bond, I found that I was getting really board with it. It seemed that every game just boiled down to an exercise in counting. Defenders of the Realm has completely revitalized me because of one important fact: Because you are rolling dice to combat enemies, you can no longer immediately determine what the best option is..... you have to carefully weight your options and decide when its important enough to press your luck. On top of any mechanics improvements over Pandemic (of which there are many in my opinion), the theme also goes a LONG way in making this game enjoyable. I could never get into being the "scientist" or "dispatcher" in Pandemic; but let me be the Wizard here and I totally feel like a BAMF! If you like cooperative game, or are even open to the idea, please give this game a try!